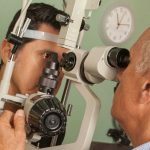 Do you need eye care in Panorama City, Van Nuys, North Hollywood, Northridge, Granada Hills or anywhere in the San Fernando Valley? Here at Dr. Leonard and Associates 818-891-6711 we’ve provided personal, quality eye care to the community since 1957. Dr. Leonard is a San Fernando Valley Optometrist your family can trust their vision to. Our staff strives to give the best possible care to our patients. So all of us take continuing education courses in order to stay updated with the latest advances in optometry, eye exams, prescription eyewear and other eye care services. 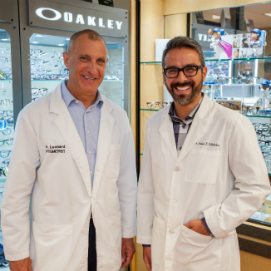 Meet the team behind the top-rate San Fernando Valley Optometrist. Dr. Leonard's team answers the phone and greet patients with a smile and a helpful attitude. Dr. Leonard is also a specialist in eye care for children. Sometimes, children are nervous about seeing an eye doctor for the first time. Dr. Leonard’s smile and friendly manner actually makes eye exams fun and something to look forward to. We provide Co-management for LASIK and cataract surgery. We also carry a large selection of fashion and designer eyeglasses and frames including Fendi, Gucci, Nicole Miller, Calvin Klein, Kenneth Cole, Thalia, Nike, Oakley and many more! Our extensive inventory includes many types of sports eyeglasses and sunglasses. We also carry a large selection of children’s eyewear including Lucky Brand and Converse. Dr. Leonard and Associates are pleased to provide our patients with an advanced digital photographic eye exam called Eye Screen. This advanced Eye Screen is a high resolution-screening photograph of your eyes which will help us document, review and compare your eyes health over time. San Fernando Valley Optometrist Dr. Barry Leonard's office is in the heart of the Valley in Panorama City, 14425 Chase St.
One of the things that makes Dr. Leonard most proud — besides seeing his patients walk out of his office finally being able to see clearly again — is the wonderful Thank You notes that his patients send him so frequently. Find out why so many people call Dr. Leonard “The Best Optometrist in the Valley.” There’s a reason he’s ranked as one of Yelp’s top Optometrists in the San Fernando Valley. 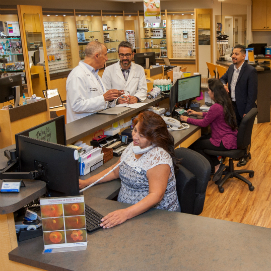 If you are looking for a new Optometrist in the San Fernando Valley, call Dr. Leonard’s office now, or make an eye appointment online using our online reservation link, at the top of this and every page. We’re looking forward to seeing you in our office soon. Schedule an appointment today! Click here. One block North of Roscoe and One block East of Van Nuys Blvd. Lots of free parking in the rear.